Light is a transverse electromagnetic wave that can be seen by a typical human. Wherever light goes, the electric and magnetic fields are disturbed perpendicular to the direction of propagation. This propagating disturbance is what makes light a wave. The fact that the electric and magnetic fields are disturbed makes light an electromagnetic wave. The fact that it disturbs these fields at right angles to the direction of propagation makes light a transverse wave. In this section we will explore what it means to be transverse. Imagine a light wave traveling toward you, on its way to entering your eye. In what direction is the electric field vibrating? (Light is both electric and magnetic, but it is usually the electric field that we are interested in.) Up and down? Sure. Left and right? Sure, why not. Both alignments are perpendicular to the propagation of the wave. How to produce polarized light. Dichroism: The property of presenting different colors by transmitted light, when viewed in two different directions, the colors being unlike in the direction of unlike or unequal axes. 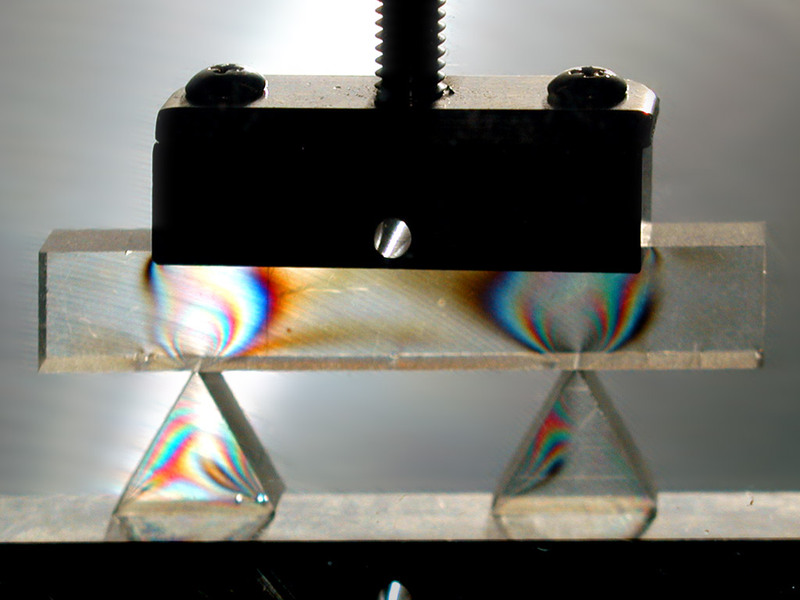 Polarized light carries information. Magnetic fields, chemical interactions, crystal structures, quality variations, and mechanical stresses can all affect the polarization of a beam of light. all sugars are "right-handed", but may rotate the polarization of light in either direction: right/clockwise/dextrorotatory, left/counterclockwise/levorotatory. Determining whether a particular compound is right or left handed is determined by a particularly complicated set of rules that I do not understand (and don't care to understand at this moment). chirality: right-handed sugars and left-handed proteins (except glycine, which is not chiral) exist naturally, the other isomers may be indigestible, may cause diarrhea, may be toxic, some organic compounds exist in both forms e.g., carvone (a diterpene) has two enantiomers: D-(+)-carvone which is found in the seed oils of caraway, dill, and anise; and L-(-)-carvone which is found in spearmint oil. "Enantiomers are stereoisomers that are precise mirror images of each other. They demonstrate equal amounts, but opposite directions of optical rotation. In all other respects, their physical and chemical properties are identical. Their physiological actions may differ, because enzymes and other biological receptors can readily discriminate between many enantiomeric pairs." Stress patterns appear in transparent materials sandwiched between crossed polarizers. Some manufacturing processes can introduce permanent stress. 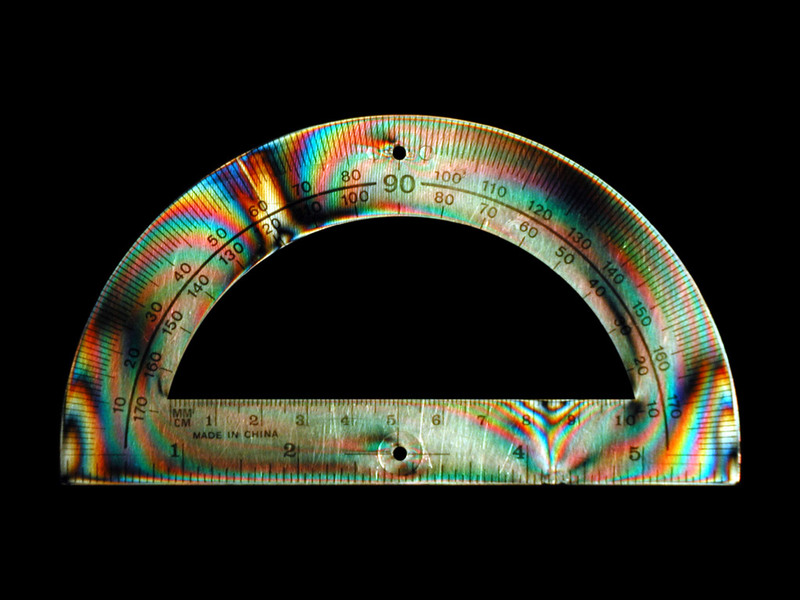 This protractor will most likely break where the stress lines are the most dense (at 60° on the arc or 4¼ inches on the base).